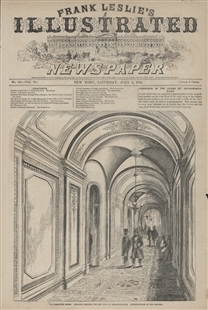 The new Capitol building was a rich mine of subject matter for stereoview producers. Grand spaces were photographed for the effect of their myriad details and rich decor, delighting viewers with their realism. 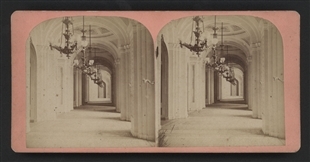 This corridor image showed to advantage the stereoview's other distinguishing characteristic—the medium’s ability to show depth of space. The progression of columns and chandeliers created an impressive image of the size and grandeur of the Capitol.